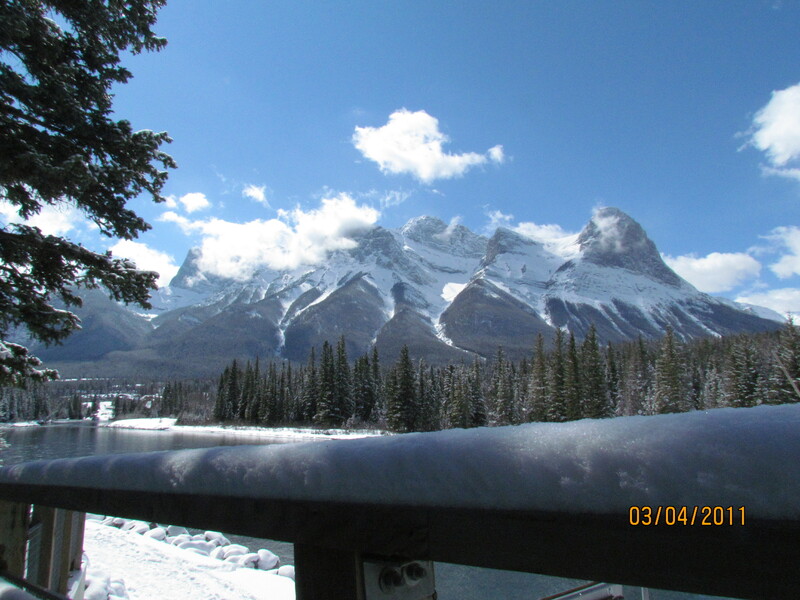 A few weeks ago spring seemed to have sprung, and while we have since learned that this was a cruel and twisted seduction that ended in record spring snowfalls; the day in question was warm and lovely so we headed out to Canmore to take full advantage of the reprieve from winter. 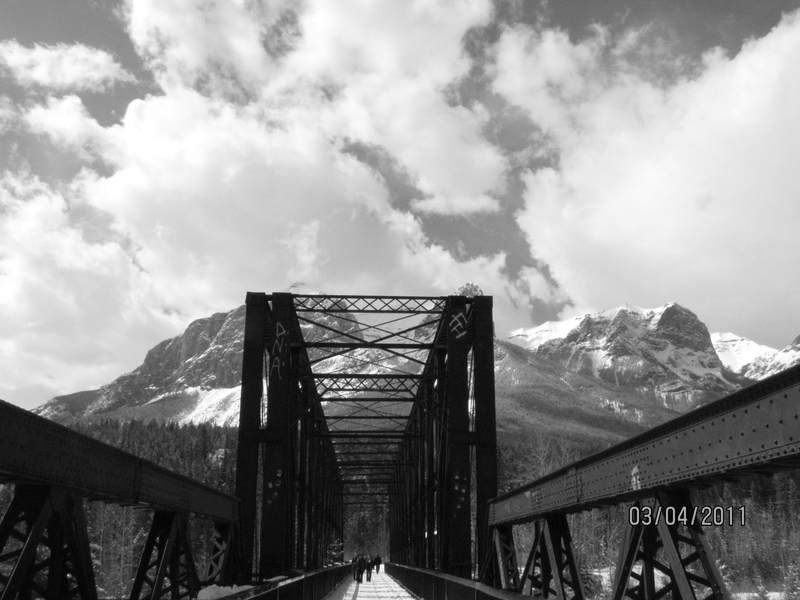 We stated our day at Whyte Horse Café (the café formally known as the Coffee Mine) very excited to get a hearty bowl of duck soup, our hopes and dreams were dashed when we were told it was no longer on the menu. What to do? Our Sunday morning was now in peril but with such a robust menu, we were able to recover. I settled on Vegetarian Chilli while Darek went for the Rabbit Stew. 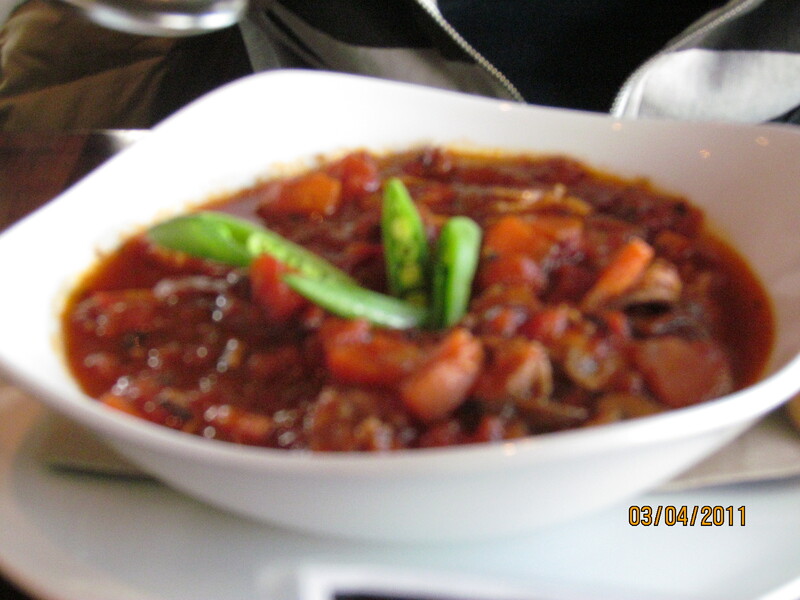 The Chilli was hearty, fresh, and flavourful and served with the most delicious fresh warm bread. The bread is not gluten free – so beware; I did not ask about the chilli but had no pain or problems later in the day. The bowl of chilli was memorable and would hands down order it again – it was not too spicy with only the slightest hint of heat. The Rabbit Stew was also incredible, the meat was tender, not gamey or overpowering it simply lent flavour to the dish. 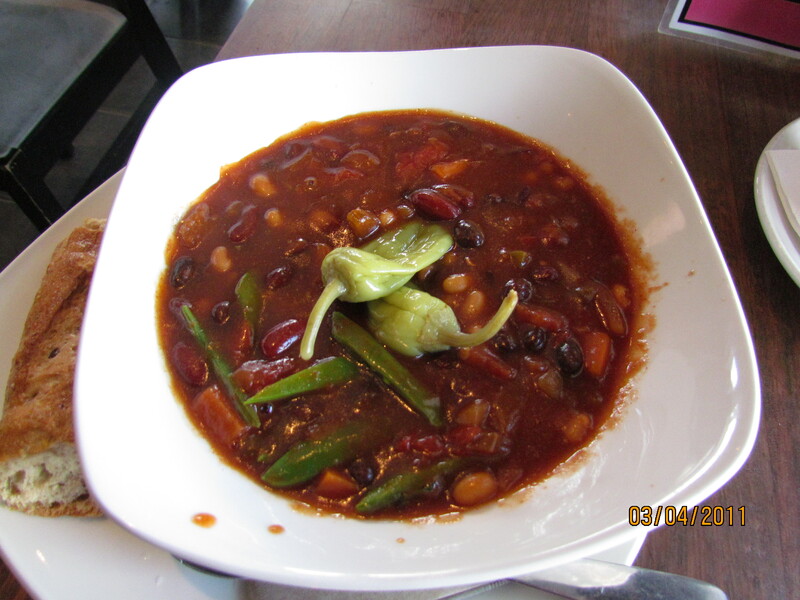 The stew was chock-a-block with fresh vegetables, and did not feel like a heavy dish. It is a dish worth a try if you are a carnivorous or adventurous type! 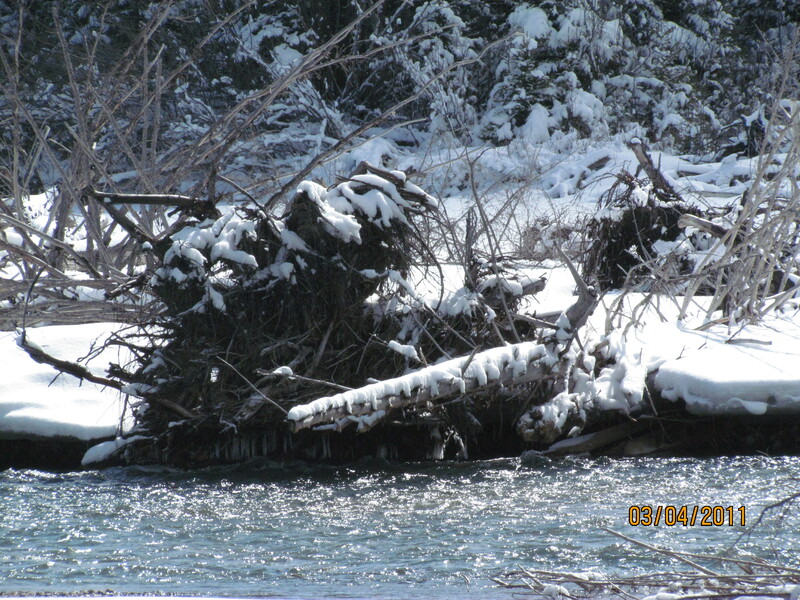 We did eventually head out for a hike, well a walk…well okay a stroll along the river. We did get some great photos and even took time to sit down and enjoy the sun on our faces. This of course worked up a bit of an appetite so we headed up to the Iron Goat for some afternoon snacking. Deciding to indulge in an alcoholic beverage, I was pleased to see the summer drink menu was out, so I ordered the Basil Grande. Wow! Grand Marnier, Raspberry Liquor finished with strawberry puree, basil and black pepper! It was a lovely afternoon treat. If memory serves me well, there were about 4-5 drinks on the summer menu so I will diligently do my duty during the next few months and go on a tasting trip and report back! For snacks we settled on the Sweet Potato fries and Duck Wings. While the fries are good; I don’t think it is worth it for the price. There are other appetizers on the menu that deliver far more value for your dollar. 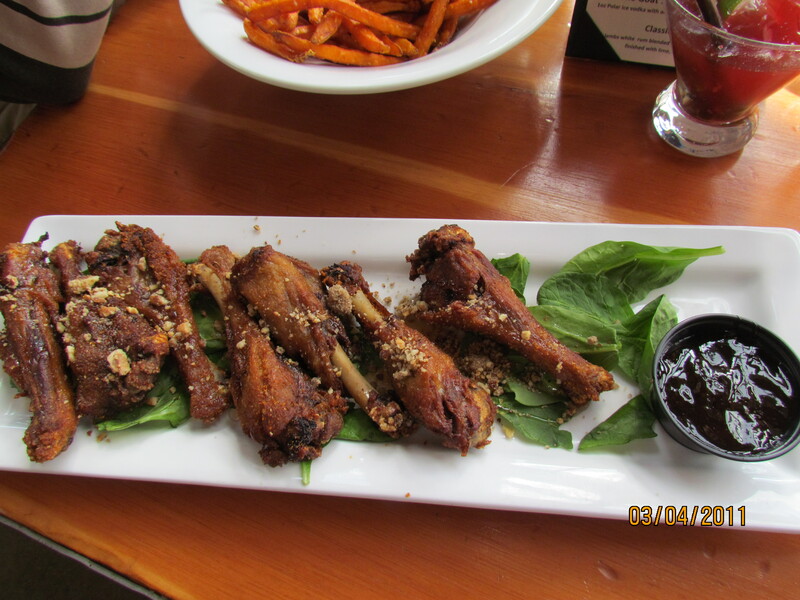 The Duck Wings though – HOLY well…duck! They are outstanding! 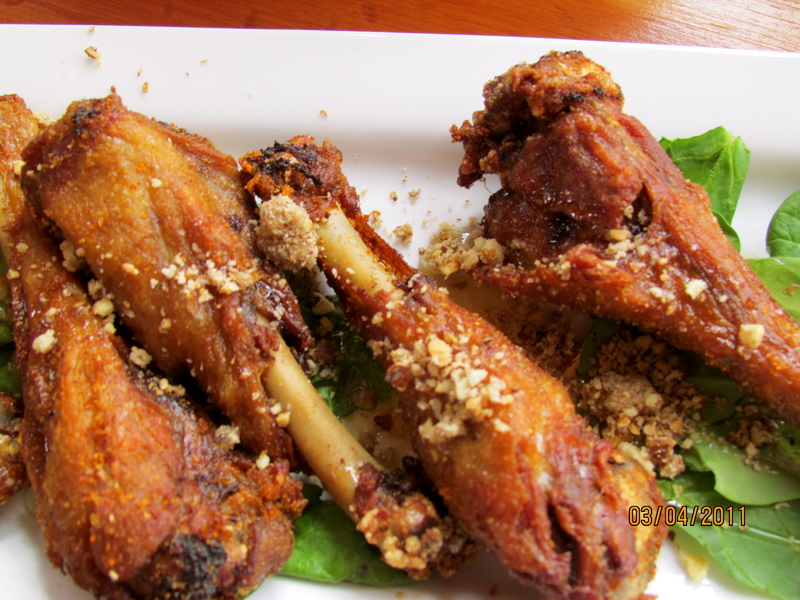 Crispy, coated with a spicy, walnut breading and not at all greasy I still dream about these wings. Served with a sticky honey sauce on a bed of greens, these wings are an outstanding culinary delight! 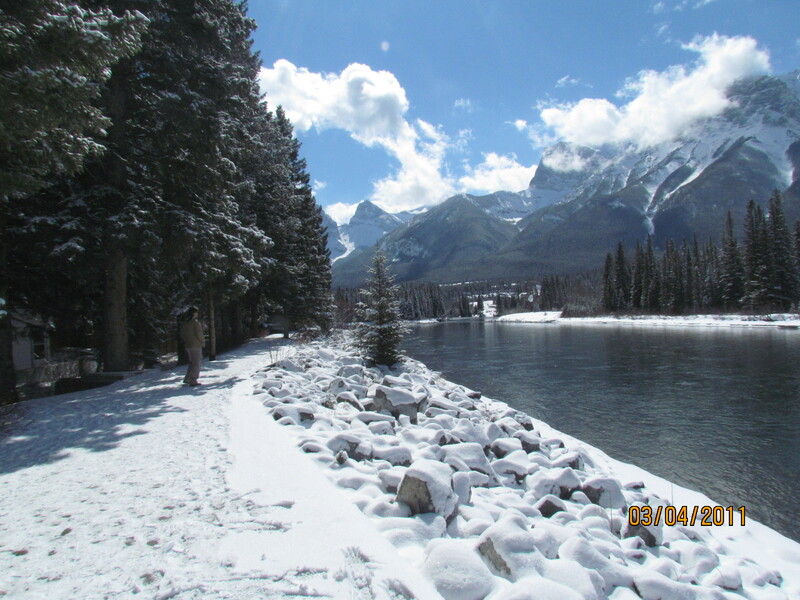 So the long and short of it, next time spring teases you head to Canmore for some warming stew, take a stroll along the river and finish off your day with duck….you simply can’t go wrong!